Last night, a federal judge in California issued a nationwide injunction ordering that all children separated at the border must be reunited with their families within 30 days; children under five years of age must be reunited within 14 days. This is a huge victory for kids — and Children’s Rights is proud to have supported this important action. In March of this year, Children’s Rights acted as the lead child welfare organization on an amicus brief supporting Ms. L. v. ICE, the case brought by the ACLU that resulted in last night’s order. 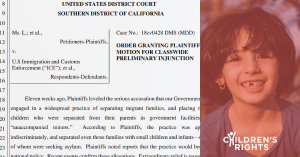 In ruling that family separation causes irreparable harm to children, the judge relied on evidence of the irreversible psychological harm that forced separation inflicts on children, which was detailed in the amicus brief. The injunction also orders that all separated children must be allowed to talk to their parents within 10 days, and in the future adults cannot be deported without their children. Children’s Rights will continue to work with our advocacy partners to ensure that government actors reunite families as quickly as possible. Learn more about our work here.